Each time Apple releases a new product there is usually a collective groan from the faithful. With the iMac, it was the lack of a floppy drive and serial ports. The iPad had no USB ports or simple way to move content from one device to another. The Macbook Pro ditched the optical drive years before the rest of the PC world would consider life with out DVDs. Last spring landed one of the most controversial Apple products to come out of Jony Ive’s design studio—the 12-inch Macbook. With only one USB-C port—used for both charging and input, the head scratching and bitching tempered the coolness factor of what a revolutionary product this light, two-pound notebook really is. I spent the better part of two months weighing the positives and negatives of whether to spend $1300.00 on what reviewers called an underpowered, port-lacking, retina screened gold-colored beauty. I was looking for a notebook, not to replace my trusted, but heavy 17-inch Macbook Pro I use at work, but a notebook, I could slip into my ThinkTank Retrospective 7 camera bag and have with me everywhere I go. My newspaper is also moving to a digital first workflow–meaning that we are publishing first online before it shows up in the print newspaper. The pace is picking up and I need to be able to send as quickly as I can to meet the tighter deadlines. As a photojournalist, I had reservations about whether the 1.1 GHz Intel Core M processor would be able to handle my Photo Mechanic/ Photoshop workflow. I searched online reviews and they were all really vague as if this little laptop could handle the stress. 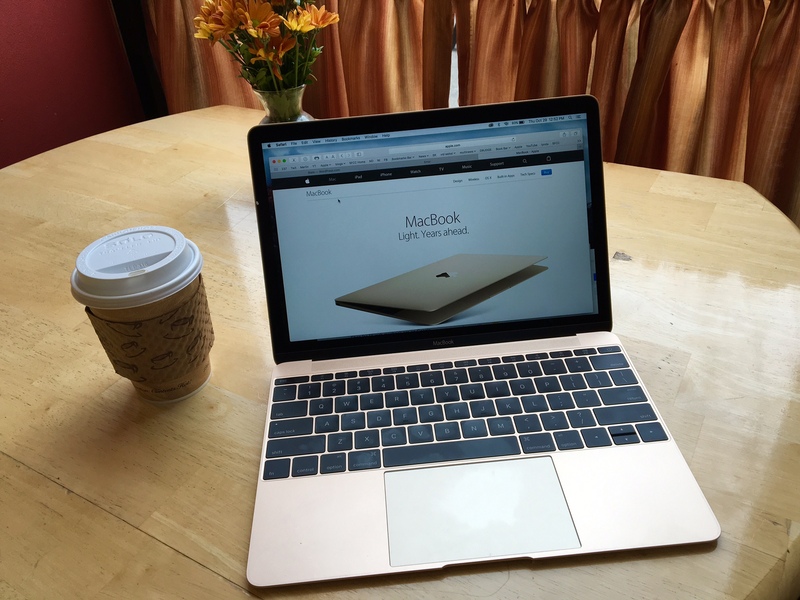 I decided to take the gamble and purchased the Macbook last week. So far, I am really impressed with the performance. If you are doing a normal photojournalist’s workflow of ingesting into Photo Mechanic, editing and captioning the selected images, opening them in the Adobe raw converter and finally moving them into Photoshop for final corrections, then yes, this notebook will handle it just fine. 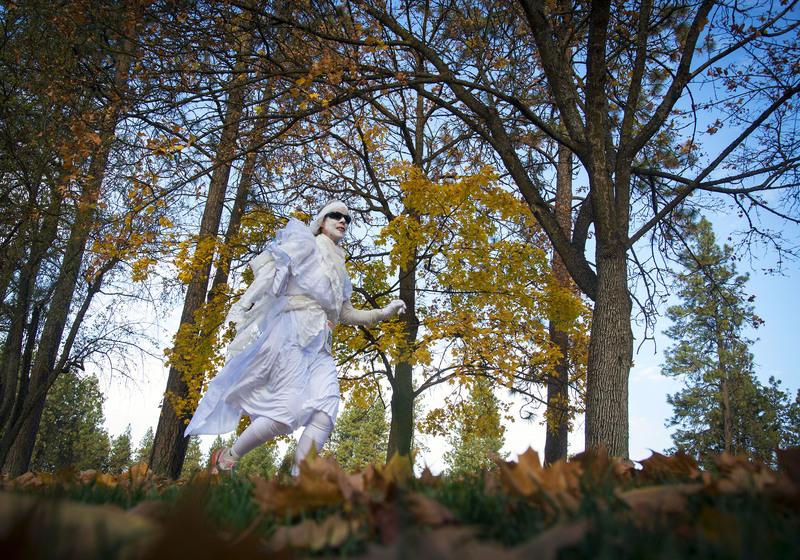 Last Sunday, I shot a Halloween Monster Dash fun run. I followed the above workflow and downloaded and edited 300 or so images into 14 color corrected captioned pictures. The Macbook never froze or slowed down, I was able to FTP the images back to the newspaper just like my 17-inch Macbook Pro. The screen is bright with tons of detail that I am not used to seeing on such a small notebook computer. A few days later I was tasked with finding a feature picture in-between photo assignments. 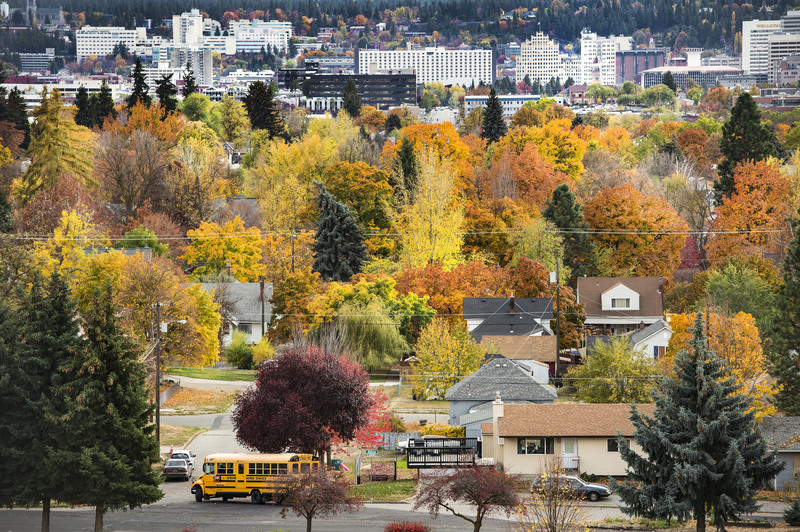 It was late in the day and I found a fall color picture of the tri-colored trees with the downtown buildings in the background. After taking the photo I sat in my car and opened up the Macbook and plugged in my Lexar card reader into a USB 3 to USB-C adaptor and quickly worked the image and sent it back to the newspaper via my cellphone hotspot and FTP. I found it much more comfortable to work on the small and light Macbook then the huge and heavy 17-inch Pro. A few minutes later I was off to my next assignment, with the Macbook tucked back safely my camera bag. For now I am happy with my the decision to go with the Macbook. The limitations are not for everyone. I will buck up and buy the dongles to make the one input port work for me. Other than that I like everything else about the computer. I am even getting used to the new thin keyboard. I believe days of heavy laptops are numbered and Apple is leading the way with the Macbook 12-inch.